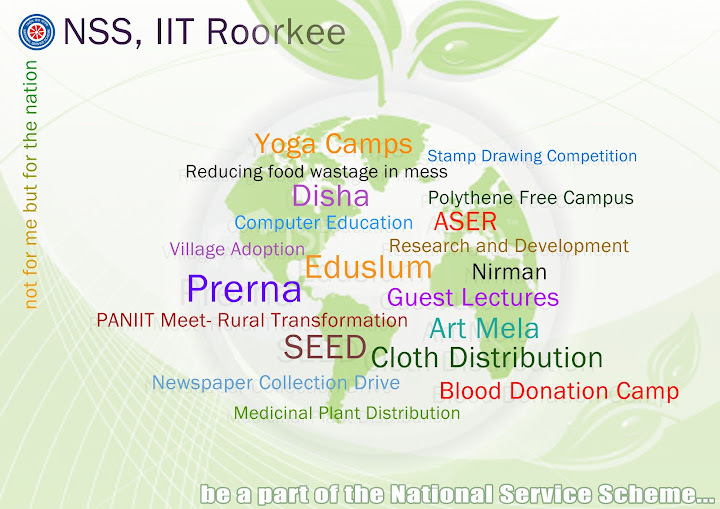 NSS IIT Roorkee: Why opt for NSS? You say its a thankless job. You say that others don't work as much. You say that you're not making a difference. You say that profis are useless. You say that people don't care. You say that you don't care. You might even say that NSS is useless. Has someone smiled because of you? Has someone jumped up in joy to have you teach them? Does someone respect you for the change you've brought around? Have you ever made a difference? Does someone, somewhere owe you their small comforts? This is the time to choose. The time to decide: Will you stay and help NSS? Will you make a difference next year? You can choose to walk away or stick around. You can choose your comfort over others' pain. You have the power to be the lifeblood of NSS next year. The question remains - What will you choose? Online Registrations for proficiencies are now open on the intranet. Choose, and choose wisely.